President Donald Trump's first foreign trip as president will come at the end of May and will include stops in Saudi Arabia, Israel and Palestine. After receiving a lot visitors at the White House, President Donald Trump is getting ready to make his first foreign trip as president. The White House announced Thursday that Trump will make stops in Saudi Arabia, Israel, Palestine and Rome — including Vatican City. The president's visits to both Israel and Palestine are significant. It sends a strong signal to Israel and the world about Trump's willingness to work on peace between the Israelis and Palestinians. Trump says he wants to use his visit to the Middle East to create a partnership with Muslims there. "To combat extremism, terrorism and violence. And to embrace a more just and hopeful future for young Muslims in their countries," Trump said. This is the latest into a term that a president has waited to travel outside the country since Lyndon B. Johnson in 1964. Given Trump's "America First" narrative on the campaign trail, waiting this long to take a foreign trip might not be that surprising. 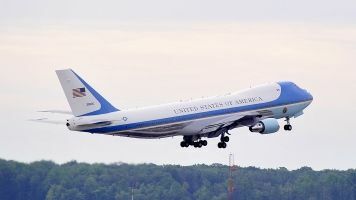 Trump could reverse a trend of increased travel for presidents in the last 50 years or so. Our three most-traveled presidents in history have been the last three presidents. Trump's trip is expected to start May 19 ahead of the G7 Summit in Italy.